It all started last Thursday with an early morning call about Cigar’s leg looking like an overstuffed leg of lamb with a fever of 103 degrees. Cigar Day One Our vet is out on medical leave, so we called Ms. C’s vet who kindly agreed to take on the case. She arrived at the farm before I did and had already administered some banamine to give Cigar some relief from the pain. Unfortunately the diagnosis was lymphangitis. From what I have been able to tell, it is a difficult condition to treat, it can take weeks to resolve, and the prognosis in many cases is guarded. So show season is over. We have submitted our year end award packets. The trailer has been cleaned. My show coat has been mended. Memberships for next year have been renewed. Fall shots have been administered. The saddle fitter will be stopping by soon for a saddle checkup. So what does that leave us to do with our time? Plenty. Next year we (okay, okay, mostly me – Ike doesn’t much care what we do) want to make the leap to Third Level. That means there are some mad skills that we need to acquire over these winter months to be ready for the challenges presented at this next level of dressage. We wasted little time after the championship show to get back to work since a quick read of the Third Level tests shows that there is some work to be done. Having just spent the past year working on and improving our Second Level work, I have a higher degree of confidence in our collection skills, but Third Level means no more half-assed collection. Do or die, there is no try. 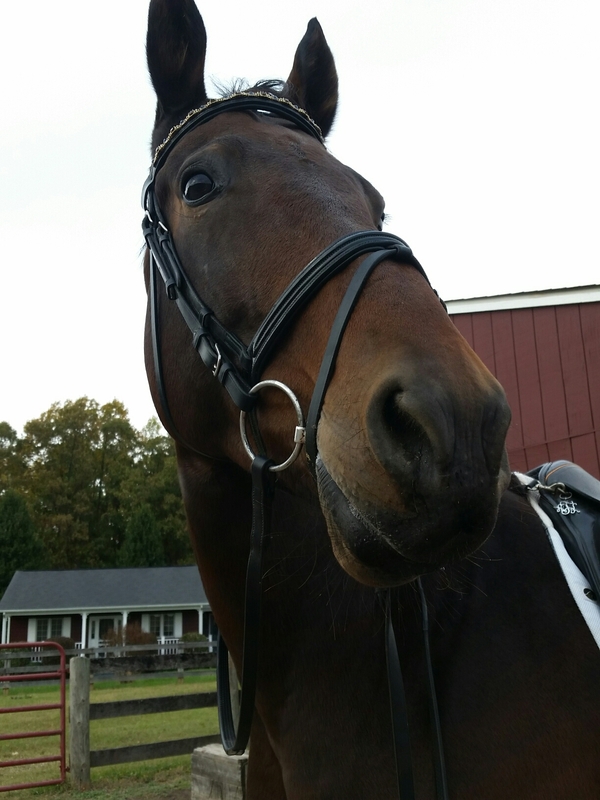 Fortunately Ike is working well in the snaffle, so we can save the double bridle for another day. Medium gaits…coming. Extended gaits…umm, what are those?? As long as Ike doesn’t decide that a potty break is necessary during the test, we can approximate an extended walk. An extended trot? We will take our 5 and hope that Ike continues to develop his pushing power. Half pass. Well, I have more to learn about riding a correct half pass than Ike does. One must move the shoulders first, the shoulders. And much like shoulder in, the rider needs to keep their weight in the correct place despite where my horse tries to put me. Turn on the haunches? Sigh, I was saddened to see that they follow us to Third Level. We will continue our efforts on this as well. And then there are the flying changes. Left to right is usually easier since Ike wants to shift his weight to the right hind. Right to left needs to be ridden a bit straighter or we only change in the front. Thankfully we have not lost any shoes during this scrambling moments. The downfall to teaching the changes? Someone starts to anticipate them and gets a bit strong in the hand. The solution? Canter-halt transitions, canter-walk transitions, or staying in countercanter. All of these require that I use every skill I have in my arsenal to make Ike listen. I can thank Cigar for my ability to stay astride during Ike’s panicked moments…and I still have the double bridle available if necessary. Stay tuned. We will let you know how how are winter homework is progressing.